Sichuan Province, located in southwest China, is one of the largest and most inaccessible provinces in the nation. This province covers an area of 485,000 kilometers (187,000 miles) and boasts the largest population in China, with 87 million people. Sichuan is bordered by the Tibetan Plateau in the west and by the Three Gorges and the Yangtze River in the east. The eastern part of the Sichuan basin is ringed by lofty mountains and experiences a subtropical and humid climate. The western part is considered the highland area and experiences frequent fog with intense sunlight, but low temperatures. The annual rainfall in this province is 1000 millimeters and the average annual temperature is 16.5C. 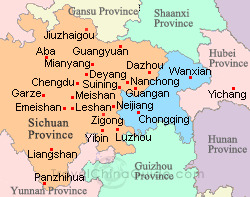 Chengdu is the capital of Sichuan and is the cultural and industrial center for the agricultural Chengdu Plain. Chengdu was one of the first centers of printing in China and has been famous for its luxurious satins, brocades, and lacquer ware since the 13th century. Chengdu is also home to the Chengdu Giant Panda Research Base, one of the most important centers in the world for the captive conservation of the Giant Panda. The Research Centre has evolved into China Panda City. Panda City encompasses a museum, as well as the Chengdu Zoo. Songpan, SichuanSichuan is known as the ’Land of Abundance’ and has three places on the World Cultural and Natural Heritage List: Jiuzhaigou Scenic Area, Huang Long Valley (Yellow Dragon Valley) and Mount Emeishan including Leshan Giant Buddha. Visitors to this province can experience a wide variety of beautiful landscapes including plateaus, mountains, ravines, basins, hills, plains, rivers, lakes, hot springs, waterfalls and limestone caves. In addition, tourists can visit important historic relics and taste the delicious spicy Sichuan Cuisine. Emeishan is one of the four most sacred Buddhist Mountains in China. Local legend has it that the mountain derived its name from two peaks that face each other and resemble eyebrows. The undulating peaks, covered with lush forests and green bamboo occupy an area of more than 300 square kilometers (116 square miles) in southwest Sichuan Province. Mt. Emeishan draws many types of visitors, from pilgrims making sacred journeys to climbers attempting to scale the magnificent heights. Most of the monasteries and temples on Mt. Emeishan were built during the Eastern Han Dynasty (25-220AD), while others were added later. As a well-known Buddhist sanctuary, Mt. Emeishan once had more than 100 monasteries. The mountain is known for its steep cliffs, lofty peaks, roaring waterfalls, gurgling springs, towering trees and fragrant flowers. Qingcheng Mountain is located just southwest of Dujiangyan. Mt. Qingcheng is also known as Green City Mountain because the towering peaks covered with a dense forest of ancient trees are thought to resemble city battlements. Nestled among the lofty trees are 108 monasteries, temples and pavilions with the highest peak, Laoxiaoding (Old Heaven Top), rising 1,600 meters (5,250ft) above sea level. Jiuzhaigou is a deep valley of stunning natural beauty, approximately 620 square kilometers (240 square miles) and is located in north Sichuan. It is a national park and has also been declared a UNESCO World Heritage site. The name Jiuzhaigou refers to the 9 Tibetan villages that are situated in the valley. The valley has a variety of natural scenery - lakes, waterfalls, snowy mountains and lush green forests. There are also more than 100 lakes of various sizes and shapes that sparkle with color in the flickering sunlight. Huang Long Valley has some of the most beautiful scenery in the world. In 1992 it entered ’China World Cultural and Natural Heritage List’. It covers an area of about 700 square kilometers (270 square miles) and has two parts: Huang Long and Muni Gorge. The Dujiangyan Irrigation Project was completed around 250 BC during the Warring States Period. Prior to its construction, the Chengdu plain was prone to flooding in the winter and drought in the summer. Libing, a governor of Shu in the Qin state, created the system. Libing employed a method of channeling and dividing the water to harness the Minjiang Rivers. This was accomplished by separating the project into two main parts; the headwork and the irrigation system. The project effectively controls flooding and provides a method of irrigation. Leshan Giant Buddha is an enormous statue carved into the side of Lingyun Mountain. The Buddha is over 71 meters (230 feet) tall and is wide enough for more than 100 people to sit between its feet. The massive carving began in 713 AD during the Tang Dynasty and was completed in 803 AD. The Buddha overlooks the confluence of the Min, Qingyi and Dadu rivers and is reputed to be the largest carved stone Buddha in the world. A local saying says, ’The Mountain is a Buddha, the Buddha is a mountain’. As one of the largest provinces, Sichuan has more than 15 minority ethnic groups living side by side with the Han people. Among these are the Yi, Hui, Quian, Tibetan and Miao people. Each of these minorities has its own charm, ethnic style and folk customs. Each of the minorities also has its own festivals. Some of the local festivals are; the Leshan Giant Buddha International Tourist Festival, Southland Ice and Snow Festival, Liangshan Yi Ethnic Minority Torch Festival and Zigong Lantern Festival. Sichuan Cuisine is one of the Eight Great Cuisines in China and is famous all over the world for its richness and variety. Characterized by spicy and pungent flavors, Sichuan Cuisine, with a myriad of tastes, emphasizes the use of chili, red hot peppers and garlic. Sichuan food is known for being ’spicy’ hot! It’s said that one who doesn’t experience Sichuan food has never reached Sichuan. Typical menu items are: Hot Pot, Smoked Duck, Kung Pao Chicken, Twice Cooked Pork and Mapo Dofu.